It was one of those hot summer days, and Manuel, a Middletown resident, parked his car and left his family to carry the barbecue, cooler, towels, sheets and a ball. He climbed down the rocks, took off his clothes (well, not all of them), gathered momentum and jumped in the water, making a big splash in the crystalline waters of one of Woodstock’s springs. It was a Sunday, a day of rest. 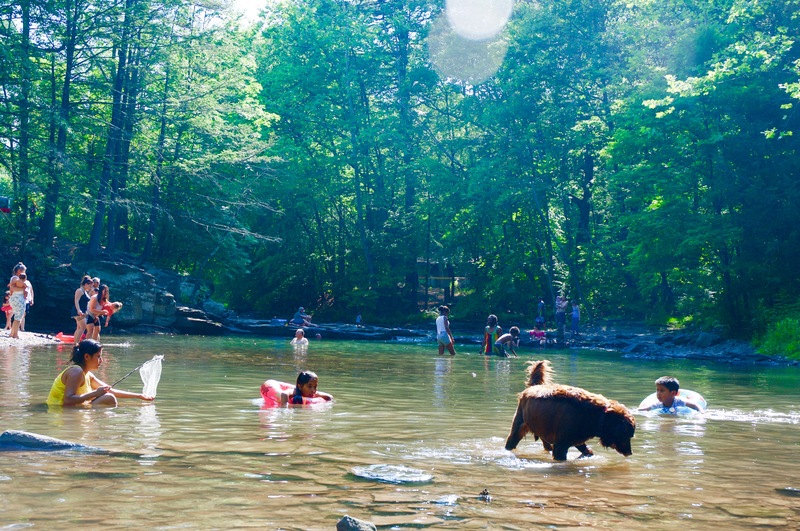 What better way to do so than by spending it with family and friends in the middle of nature in front of a refreshing creek, the type that runs down the Catskills and crosses the small town known by many for the rock and roll festival held there, hippies, and “peace and love”? After his much-anticipated dip in the water, Manuel, of Mexican descent, slowly climbed back up to join his loved ones and help set up the place where his family would eat lunch and dinner along with the families of his brother-in-law and a co-worker, for a total of 14 swimmers. Manuel, who asked not to be identified for “status” reasons, does not mind the 62.4-mile, 1-hour-15-minute ride to the springs. He has been coming here for the past five years because it is free, because it does not have the chemicals found in pools and, most of all, because it “relaxes” him. Legend has it that the Woodstock spirit has attracted a great number of painters, musicians, writers, filmmakers, photographers, intellectuals and free thinkers who, in one way or another, have coexisted in love, peace and quiet, sometimes even in a communal manner. For years, “Woodstockers,” mostly white English speakers, got away with keeping the location of the springs secret. Despite their sense of community and desire to share, they did not want too many people to know about places where, on hot days, some of them indulged in free love while others swam wearing nothing but their birthday suit. On the day of the picnic, among playing children, splashing swimmers, barking dogs, guitar chords and the smoke coming from the grill, Manuel bumped into Hondurans from Kingston, Ecuadoreans from Queens, Mexicans from Poughkeepsie, Salvadorans from Saugerties and Dominicans from the Bronx, among others. Although there were also African American and white visitors and other ethnicities, the Spanish language seemed to dominate the atmosphere. All the hubbub taking place around the springs has already caused some conflicts with the town and its residents. They complained that visitors double-park or do so on private property, so the town has installed several signs warning of a $150 fine for people violating the rules. Allyn, who has traveled the world and likes to speak Spanish, says that the problem is that the media has revealed the location of the springs and listed them among the 10 best places to take a dip in New York State. That has given him a new pastime and the difficult task of shutting down the open secret by writing to the media asking them to stop encouraging people to visit the area to swim in the refreshing and almost medicinal spring waters of Woodstock. Where are they located? The two springs in the town are the Upper and Lower Millstreams. The former is on the corner of Tannery Brook Road and Ohayo Mountain Road. The latter is on Millstream Road. But don’t tell anyone!